​An overview of global patterns and trends in the availability and consumption of ​land/food, including changing diets in middle-income countries. What has happened to the area of land used to grow crops as human population has increased? Use Fig 7.32 to briefly describe increases in the area of cropland worldwide. Now study Fig 7.33 and 7.34. What does this show us about changes between 1960 and 2000? Where has cropland expanded and where has it declined? Why is the area of cropland likely to increase or stay high in LICs? Why is it likely to decrease in HICs? Support this with examples. Where can you identify exceptions? What is meant by farm productivity? Which parts of the world are experiencing the greatest and slowest increases in productivity. What factors are causing increasing productivity in most of the world? "Global food security has generally improved over the past decade, in line with record agricultural production and lower food prices. But recent macroeconomic, socio-economic and political trends suggest that continued progress is not a foregone conclusion. Fluctuating global economic growth, increasing inequality, political instability and forced migration, among many other factors, also have a significant impact on whether populations remain well-fed. Climate change and natural resource depletion will only aggravate these trends, while severely threatening the United Nations’ Sustainable Development Goals (UN SDGs) of ending hunger by 2030. According to a recent study from the UN Food and Agricultural Organisation (FAO), by 2030 an extra 35m to 122m people could fall into poverty and therefore become less food secure as a result of climate-related risks." What is the Global Food Security Index and, briefly, how is it calculated? Describe the global pattern of high AND low scores of food security. 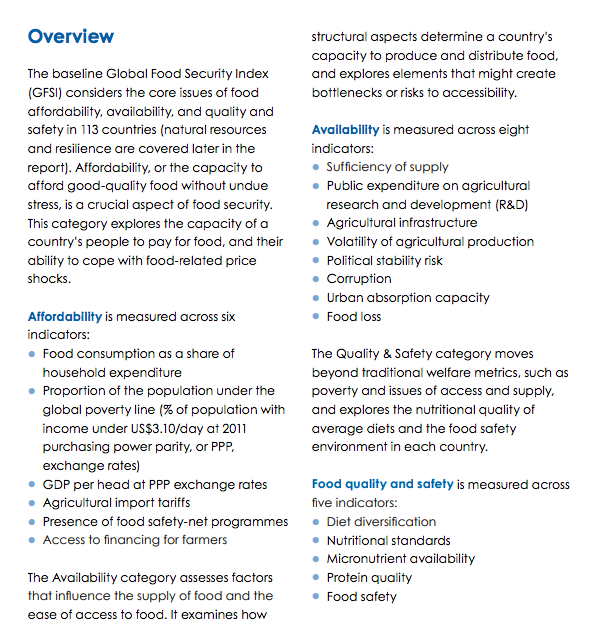 Describe the global patterns of high AND low levels of food affordability. Describe the global patterns of high AND low levels of food availability. Describe the global patterns of high AND low levels of food quality and safety. Suggest reasons for the patterns you have identified above. Identify the regions that appear to be showing an increase in food security over the last five years. Also identify the regions that appear to be showing a decrease in food security over the last five years. Describe patterns of undernourishment in 2015. Comment on the situation in China, Niger, Indonesia, Singapore, USA. Why is there no data for HICs? Suggest reasons for the lack of data in other countries. Based on the articles and TED Talk above and the student textbook, in what ways are the diets of the rising middle class changing? What is meant by "Food homogenisation"? Give evidence that it is occuring in the NGMC. Explain the impact of the changing diets of the rising middle class. How do the articles suggest that climate change is likely to compound these issues?